1. Unless you have one already, I do not recommend that you purchase this device for operation with Shion. The major reason is that SmartHome really dropped the ball with this device, providing no APIs or other documentation for outside control. The support that you see has been reverse-engineered by myself with consultation with the sources from the OpenLinc project. 2. The major problem with the device is that available HTTP access points are built around an atrocious AJAX interface, leading to the bewildering outcome that the device is effectively one-way only, defeating the major reasons for using the INSTEON platform. 3. This means, while you will be able to send commands out to devices, you will not be able to monitor their state, making this device really only useful for controlling lamp and appliance modules. The thermostat device does work with this, but you will not be able to get the current temperature, nor pick up any remote changes in the thermostat’s state. As for motion and contact sensors – forget about it. 4. In terms of what this device does do, you can treat it like a one-way X10 controller. 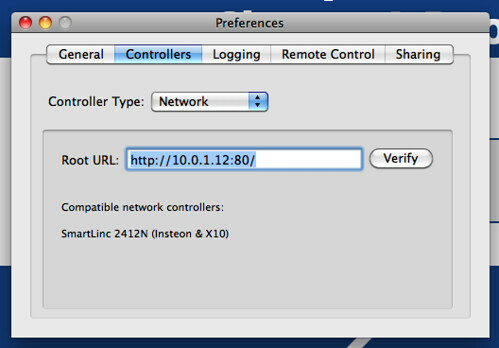 Commands can be sent to both INSTEON and X10 devices without any issues. 5. If you’re a tinkerer and would like to see how I implemented support for this device, the code is available in the Shion Framework source control (ASSmartLincWebController.m). I have some UI work that I would like to do before pushing out a new release with this functionality, but keep your eyes open over the next few days for an update.